In this paper ABARE's Global Trade and Environment Model (GTEM) is used to analyse the potential of international emissions trading as a mechanism for helping to achieve the abatement commitments agreed to in the Kyoto Protocol. The prospect of two emission trading blocs, one consisting of the European Union and eastern Europe and the other consisting of many of the remaining Annex I regions, is also considered. The analysis shows that the carbon penalty varies significantly across regions when no emissions trading is allowed. In aggregate, the cost of abatement to Annex I regions falls with emissions trading.Under the assumption of the two trading blocs, the carbon penalty in the European bloc is higher than with full Annex I trading. The paper also considers the impact on developing countries and the role of carbon leakage in determining the economic impacts on Annex I regions. 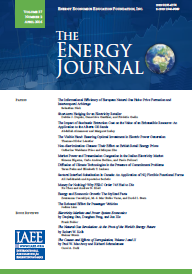 Published in Volume 20, Special Issue - The Cost of the Kyoto Protocol: A Multi-Model Evaluation of The Quarterly Journal of the IAEE's Energy Economics Education Foundation.